June 2012 – Thanks to the generosity of the Wheels in the Woods Foundation, Connecticut Audubon Society has completely refurbished two special use trails and a beach access ramp at three of its most widely-used sanctuaries, in Fairfield and Milford. The trails include the mile-long Edna Strube Chiboucas Special Use Trail, at Connecticut Audubon’s Larsen Wildlife Sanctuary, adjacent to the CAS Center at Fairfield. Opened in 1999 and designed for wheelchair use, the trail was the first project undertaken by the Wheels in the Woods Foundation. It was renovated this spring to provide an upgrade and to repair damage caused by last year’s storms. To accommodate wheelchairs, the trail is five-to-seven feet wide and paved with finely crushed rock. It circles through the sanctuary’s 155 acres, following an easy grade through the woods, along the edge of a meadow and over several streams and swamps. Interpretive signs stand at intervals along the way, and there are numerous benches for sitting. “The trail is ideal for people in wheelchairs, but it’s also designed for folks who use canes or walkers, or for anyone who wants to walk through the woods without worrying about tripping on roots or rocks,” said Don Chiboucas, who started the Wheels in the Woods Foundation in 1999 after being unable to find accessible trails for his mother, who used a wheelchair in her later years. 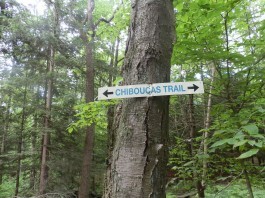 The Edna Strube Chiboucas Special Use Trail is named for her. 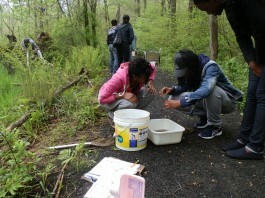 Environmental sciences students from Harding High in Bridgeport examine specimens from Pin Oak Swamp along the Chiboucas Trail at our Larsen Sanctuary. At Connecticut Audubon Society’s Milford Point Coastal Center, Wheels in the Woods funded improvements to an access ramp that leads to the beach at the adjacent Smith-Hubbell Wildlife Refuge, one of the wildest and most biologically-diverse habitats on Long Island Sound. The Coastal Center also has two wheelchairs designed for use on the beach. There is no charge for use of the wheelchairs but we suggest you call Louise Crocco, the Coastal Center office manager, to schedule a visit (203-878-7440 x 502). At the six-acre Birdcraft Sanctuary in Fairfield, Wheels in the Woods funded a complete renovation to a quarter-mile trail that circles the property and crosses a small pond and wetland. Birdcraft is the first private bird sanctuary in the United States; more than 120 bird species have been seen there.